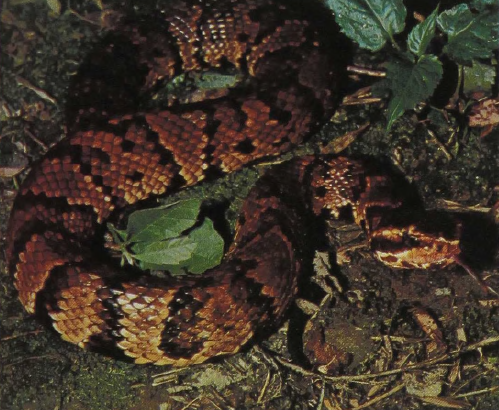 This is a fairly large (6-foot) and heavy snake of the swamps and canebrakes of the southeastern United States, whence it ranges inward along the large rivers reaching as far as southern Illinois and Missouri. The Cottonmouth hibernates in the winter along the rocky ridges overlooking the rivers. Water Moccasins feed on many aquatic animals, particularly fishes. On some offshore islands in the Gulf of Mexico populations subsist under bird rookeries, eating rats and fishes brought by sea birds to feed their young and dropped by mistake. The name Cottonmouth derives from the white lining of the mouth, which is exposed as the mouth is gaped open when the animal is disturbed. Although the venom is highly toxic, the Cottonmouth, like many other poisonous snakes, is only slightly affected by bites from other members of the same species.